Boston Freedom Trail – This trail is 2.5 miles long and is marked out in the side walk with red bricks. It takes you to 16 historic sites of significance in the fight for American independence, including churches, meeting houses, burial grounds, parks and a ship. If you love American history, this trail is for you! The trail officially starts at Boston Common where you’ll find the Visitor Information Centre. Here you can pick up maps, and leaflets explaining the sights you’ll see on the trail. However, once you have your map, you join and leave the trail wherever you like. 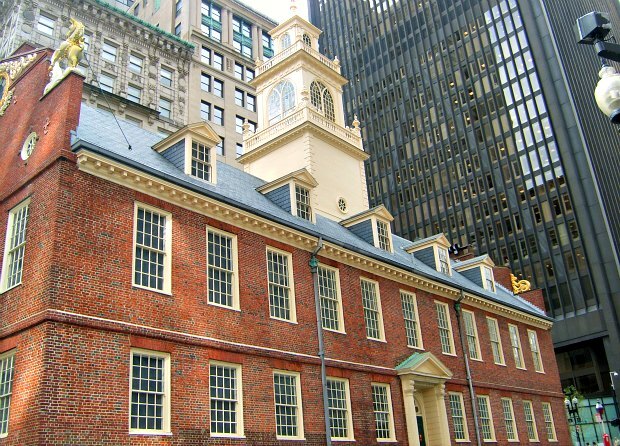 Old State House – This was our favourite stop on the Freedom Trail, for two reasons. Firstly because of its significance in marking the transition from British rule to independence and secondly because it’s a truly beautiful building. It was constructed in 1713 after which it served as the home of the British Colonial Government until the American Revolution in 1776. The Declaration of Independence was first read to the people of Boston from the building’s balcony. After this, it became the commonwealth’s first Capitol building and the State House for Massachusetts. You’ll find it at 206 Washington Street. 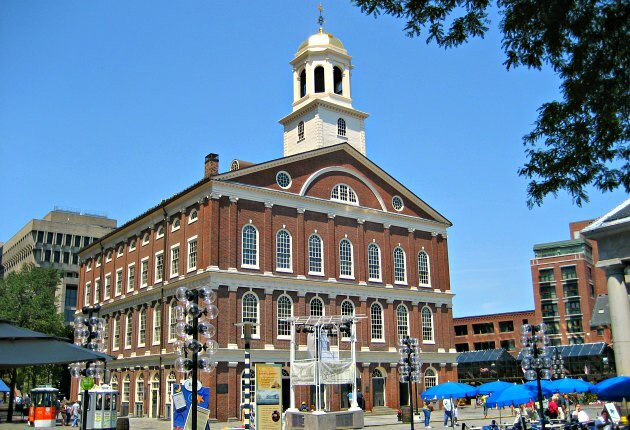 Faneuil Hall – This hall was named after the wealthy man who built it as a centre of commerce in 1742. It had to be rebuilt just a few years later after it was destroyed in a fire. It’s the meetings which took place upstairs that make this building significant though, because it’s here that the first signs of unrest were seen. Downstairs, continues to be a centre of commerce to this day, with market stalls a plenty selling produce and crafts. The area surrounding the building is known as “Faneuil Hall Marketplace” which includes nearby Quincy Market, built originally as an extension to the hall. 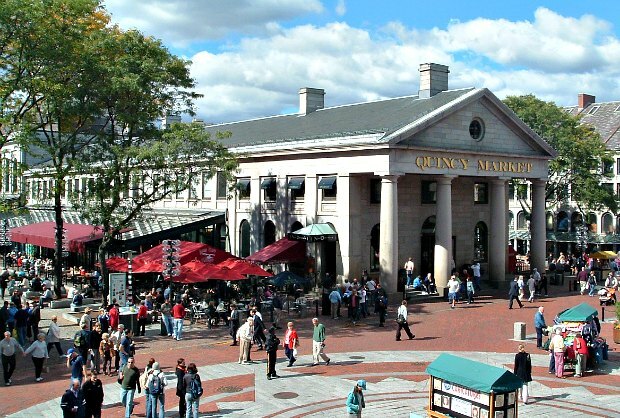 Quincy Market – Set in the Faneuil Hall Marketplace, this attractive long building with its Roman style columns, was built as an add-on to Faneuil Hall in 1826. Its purpose then, is its purpose now – vendors selling all kinds of products from individual stalls. On wet days, you can hardly move inside the market, but when it’s dry, it’s a lovely experience to browse the stalls and also to head upstairs and see the enormous dome forming the roof of the food court. You’ll also find restaurants upstairs at Quincy Market. 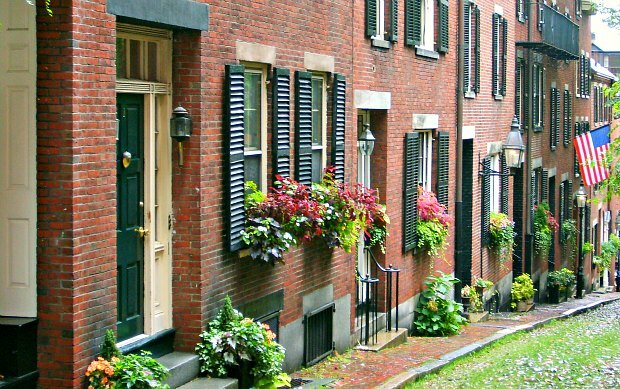 Beacon Hill – This historic and desirable neighbourhood of Boston is really lovely. It’s just a short walk from the centre , yet feels like you’re a world away in another time. Its narrow streets are often cobbled, but it’s the red-brick houses that are the big feature here. They’re all so pretty! Our favourite street was Acorn Street (pictured above), built in the 1820s which is cobbled and has perfect houses lining the road. There are plenty of other streets that are just as nice though. We’d recommend that you spend an hour or so just wandering around the streets. Think of some of the famous names who’ve lived here while you’re doing it – Edward Kennedy, Sylvia Plath, Uma Thurman, Dave Lee Roth, Carly Simon and John Kerry to name just a few. One of the busiest roads is Charles Street which is lined with attractive shops. 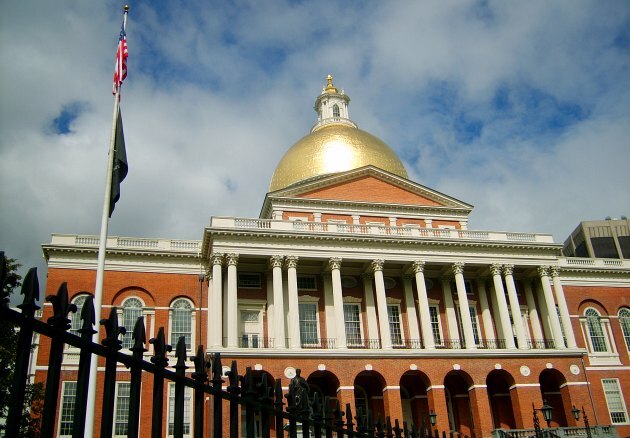 You’ll find Beacon Hill near the new State House building sandwiched between Beacon Street (which runs along the edge of Boston Common) and Cambridge Street. Boston Common – This 50 acre park is the start of the Freedom Trail and is also one of the oldest parks in the USA. It’s known simply as “The Common” and has had many uses over the years from grazing cattle to public executions! Some of the notable features include the Central Burial Ground, Frog Pond and the location of the “Great Elm Tree” which was a symbol of freedom before it was destroyed in 1876. 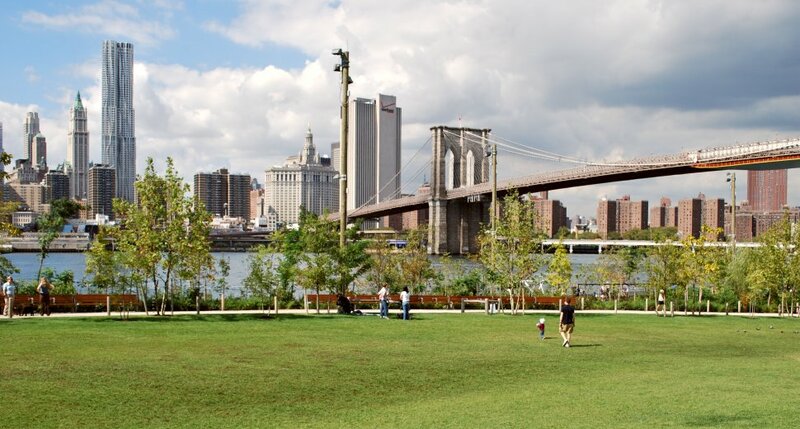 Today the common links a number of other green spaces which form a central “lung” of open space in the city. We enjoyed the history of the common, although the more formally laid out “Boston Public Garden” next door is more appealing to the eye. 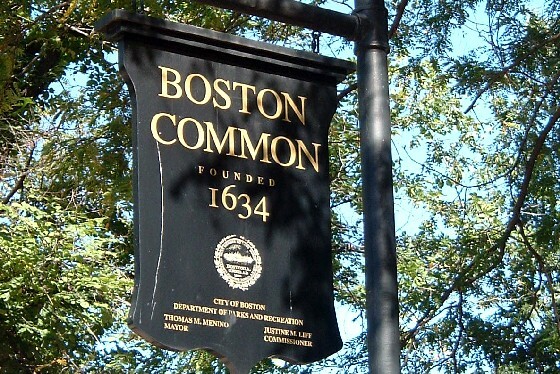 The Common is bordered by Beacon Street, Charles Street, Tremont Street and Park Street. USS Constitution – She’s known as “Old Ironsides” and it’s claimed that she’s the world’s oldest commissioned warship still afloat. The ship is open for free guided tours throughout the year. 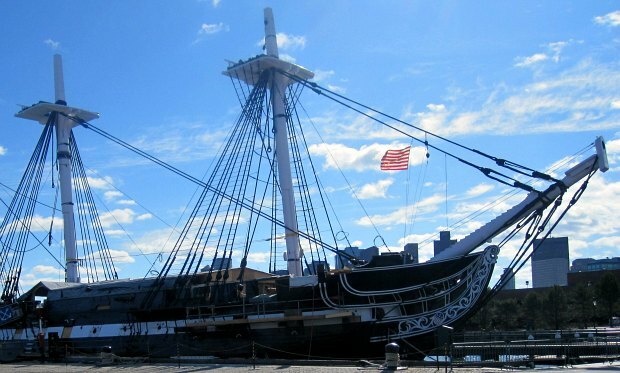 Each tour is narrated by several of USS Constitution’s active-duty United States Sailors and consists of four stations through the ship’s top three decks, with tours beginning every half-hour from 10am to 5.30pm. Each tour accomodates approximately 80 people. There’s loads to see onboard and there’s also the museum building nearby with additional displays. We really enjoyed our trip onboard. The ship is docked at Charlestown Navy Yard and is a stop on many of the tour bus routes. Copley Square – This large open public square in the Back Bay area of Boston is dominated by a number of impressive buildings. Firstly, Trinity Church which was completed in 1877 and has played host to many large events over the years due to its central location and size. Secondly, the very grand Boston Public Library which was completed in 1895 and looks like a sort of “cathedral for books”. Finally, there’s the much more modern John Hancock Tower, which is like a huge mirror, reflecting some of the older buildings. We really liked spending time in Copley Square. The atmosphere is laid back and there are often events taking place to watch or take part in. Nearby you’ll find the huge Copley Place shopping mall. Copley Square is on Boylston Street at the junction with Clarendon Street. Nearest T stop is Copley. Cheers Bar – The exterior of the building used for the TV series “Cheers” is the Bull and Finch pub in Boston. The inside shots were filmed in a studio though, so you won’t recognise the interior. Instead you’ll find a bar and gift shop along with some Cheers history. Like many tourists, we took the obligatory photo outside and had a quick look inside before moving on. 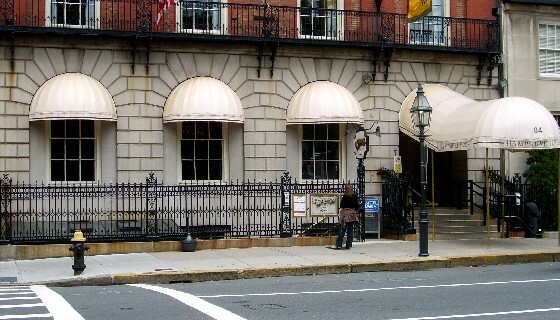 You’ll find the original Cheers bar at 84 Beacon Street across the road from Boston Common. There’s also a replica Cheers bar at Quincy Market. 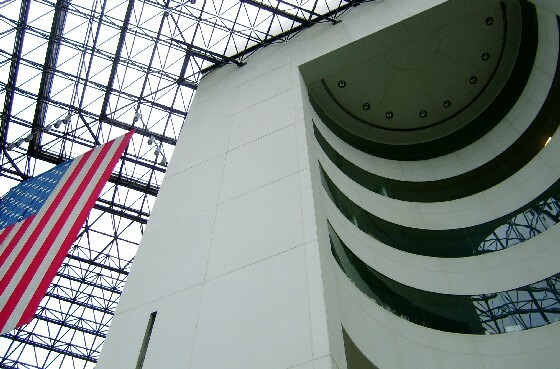 John F Kennedy Presidential Museum & Library – We loved this impressive museum dedicated to Kennedy for both its architecture and its contents. The museum tells the story of JKF’s early life, rise to politics and service as America’s 35th president. There are interactive displays, re-creations of rooms in the White House and decent food outlets too. We thought it was absolutely fascinating and well worth the ride to get to Columbia Point. On clear days, there are some terrific views of the harbour. Take the MBTA Red line to JFK/UMASS Station and catch the free shuttle bus. Christian Science Plaza – Boston is the location of the headquarters of Christian Science and the main plaza surrounded by the many buildings of importance is well worth seeing. The church here is know as the “Mother-Church” and you’ll also find here a mother church extension, The Mary Baker Eddy Library, the Sunday School building, the Christian Science Publishing House and a number of administration buildings. 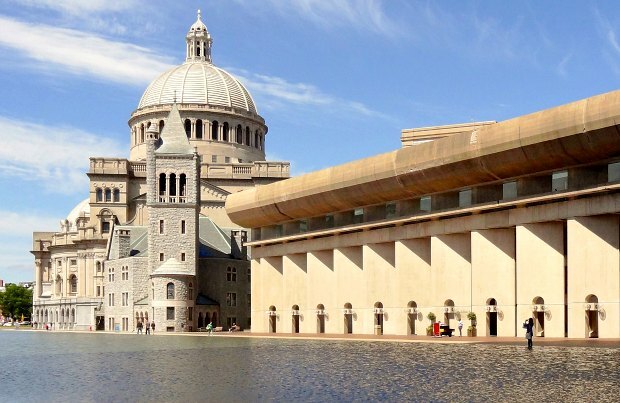 The architecture of all of them is impressive, but we liked the huge reflecting pool best. The Christian Science buildings are alongside Huntingdon Avenue and Massachusetts Avenue in Back Bay. Nearest T stop is Symphony. Harvard – It’s one of America’s most famous universities and visiting the historic campus is free. There’s a dedicated Information Center for visitors at the Holyoake Center Arcade on Massachusetts Avenue in the heart of Harvard Square. Free guided historical tours are available too from Monday to Saturday at 10am, 12pm and 2pm or you can just wander round the site on your own. We liked the feel of the open space in the centre of the campus which is surrounded by most of the major buildings. 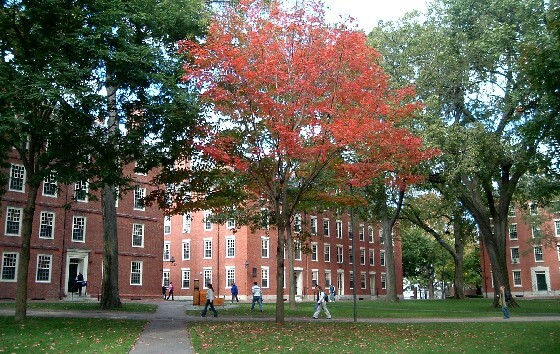 Harvard is in Cambridge, Massachusetts which is a short ride on the T from Boston Centre. The stop you’ll need is Harvard Square. 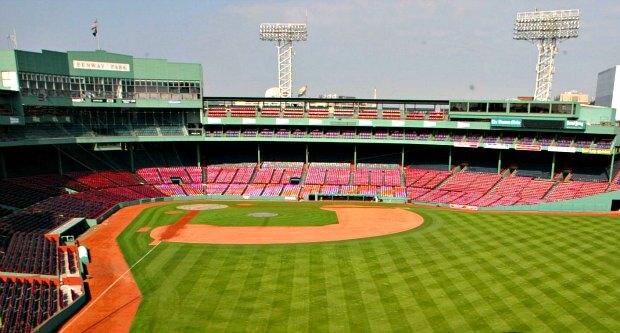 Fenway Park – Following the Red Sox baseball team is a bit like a religion in Boston and tours of the park they play at are a must for anyone on “pilgrimage”. Even if you’re not into baseball though, you can still appreciate the size, history and atmosphere of this place. Tours run daily – even on game days – and you can get tickets from the Team Store on Yawkey Way. If you’ve never been to a baseball game, we’d recommend you try and get tickets. It’s a real experience! Fenway Park is in Back Bay near Kenmore Sqaure. Nearest T stop is Fenway or Kenmore Square. 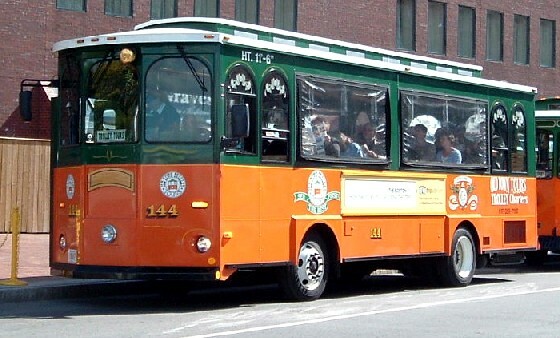 Boston Sightseeing Tours – One of the best ways to see the sights of Boston is to take one of the many tours. There are tours on busses, replica trolley cars and amphibious vehicles. We tried the Old Town Trolley Tour which was great until the rain caused the windows to steam up and you couldn’t see out! There were also so many people on board that there was no space to pick up passengers at the stops. 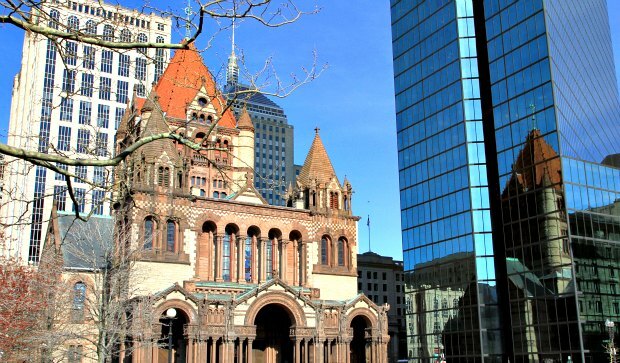 See our special page to Compare Boston Tours. 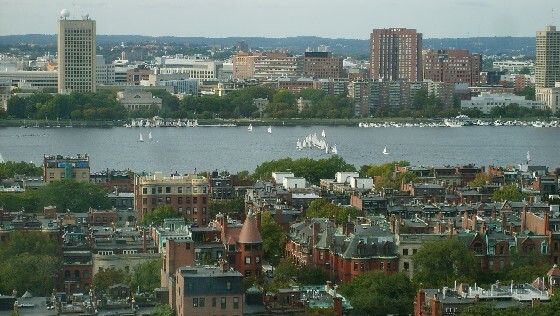 New England – We’d recommend that you take a trip out to make the most of the amazing scenery surrounding Boston. There are several places within easy reach with a hire car that are well worth seeing and in the fall the views are even better! Top of the list is Cape Cod which is around 1-2 hours drive from Boston depending on which bit you head for. Our favourite place on Cape Cod is Provincetown which mixes history with a vacation feel. Bear in mind that Cape Cod can get very busy and parking can be difficult in the summer particularly. If you’re looking for stereo-typical New England scenery, you need to take the longer trip to Vermont. 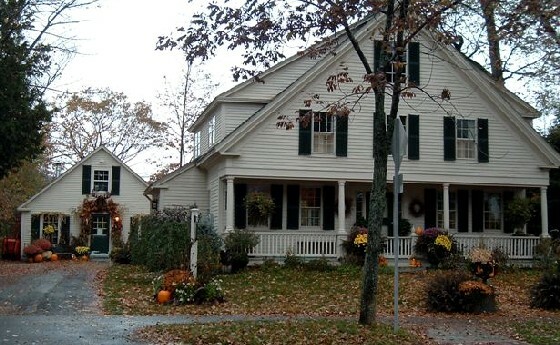 We’d recommend Woodstock and Stowe in particular with beautiful houses, farmsteads and tree lined streets. We stayed at the Marriott Copley Place when we last visited Boston which has a huge tower overlooking Back Bay. We paid extra for a Charles River view and it was well worth it! The view was absolutely stunning covering an area from Fenway Park, through to downtown Boston with Beacon Hill, Charles River and MIT in between. The hotel itself was lovely and we’d throroughly recommend it. From the lobby you can access the Copley Place shopping centre directly and there is a Trolley Tour stop directly at the front entrance. The only downside is that it’s a 20 minute walk into central Boston, but there is a T stop near the hotel. We’d also recommend The Lenox nearby which consistently gets good reviews and family members who’ve stayed there say it’s fantastic and the The Back Bay Hotel which is the hotel we plan to stay at next time we’re in Boston. It’s a former Police Station! The underground transit system in Boston is known simply as the “T”. It’s operated by MBTA and covers most of the places you’d want to visit. It’s also one of America’s oldest systems and on occasions it can feel like you’re on a heritage railway! However, we found that most of Boston was walk-able. Many of the big points of interest are centred around the Freedom Trail, and those that weren’t are usually stops on the various tour buses.